I'm working on a sidescroller game where the player spends a lot of time in water (in a physics volume). ・The camera can be changed to orthographic or perspective at the player's discretion. ・The game would ideally be playable on fairly low spec machines, like smartphones. I currently have just a flat gradient texture in the background and I also tried parenting an animated mesh with panning translucent textures on it when the player enters water, but it doesn't look good. Ideally I'd like to have something like what they did in INSIDE, where you can see little particles floating around in the water volume. I don't know how they did it, and was hoping if anyone might have any ideas how they did it. Here's a link to a screenshot of it for reference. 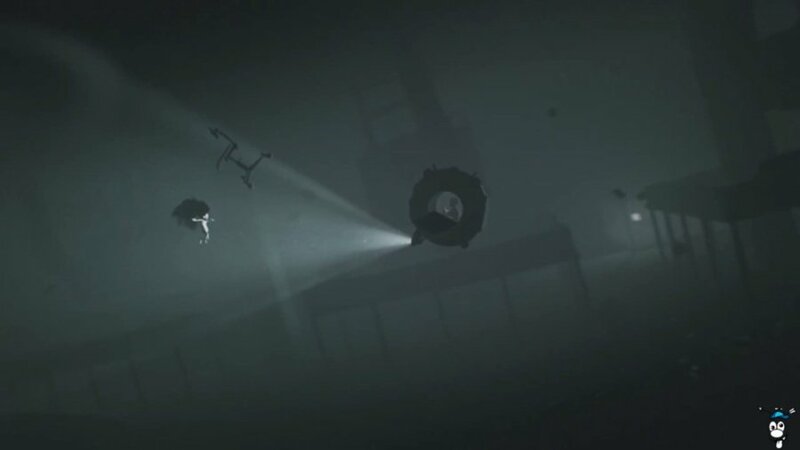 With that said, I was wondering if anyone knows of any tutorials, or just has any simple ideas for making it look like the player is swimming in water (aside from character animations and sound) for a sidescroller game. I'm all eyes. Edit: Just a guess, but maybe they used gpu sprites to achieve that underwater particle debris effect in INSIDE. I hooked up some gpu sprites, setting their initial location to a wide area, and the effect is pretty similar. I'm still open to other ideas if anyone's got something they wouldn't mind sharing. Awesome, thanks a bunch for the link, Adam Davis. Seeing this doesn't use any post process I take it this should be OK for low-spec machines. Edit: Ah shoot I just now noticed it uses World Position Offset for the wave movement. When I tried using World Position Offset on materials in 4.12.5 they wouldn't render on mobile. Still this should be good for other low-spec machines. I'm currently working with some water right now as well. Here's a video that I found really useful, hope it is somewhat helpful. Ah cool, Nken418. Thanks a lot. I extremely appreciate. Water is so difficult, getting everything right is just difficult. I've been working hours on trying to make those little white light reflections at the bottom, getting it the perfect color, trying to get audio sounding right when I'm under water. Lighting alone is already difficult but lighting in water with the refraction=death. I know there's also places where you can download water shaders, I found them somewhere once. Good Luck on the project! Thanks for the warning, Nken418. I'll keep that in mind when I start working on it. I should be able to hit it in a few hours, or next Monday at the latest. Nken418, sorry for laggy follow-up. I finally got around to checking out the link. Actually, I ran into that vid a year ago. I was a fresh newb then and could barely even navigate the editor. Regardless, if it weren't for you I would've had trouble re-searching it. Checking it out now, though, it uses a lot of post-process effects. The game I'm working on is for low-spec machines so I can't use much if any post processes. What you're after is far more ambitious than what I am. I'm just looking for simple 2.5 D-ish water effects. Thanks a lot for the link and the warning though. Much appreciated! Good luck on getting that refraction working. Is there a Rotation Follows Velocity for characters?